Open Access Week starts this Monday 19th October. In the run-up, Stephen Pinfield provides an overview of eighteen propositions on open access identified through an extensive analysis of the discourse. Key elements remain controversial. Particularly in relation to quality, researchers continue to view open access publishing with disinterest, suspicion and scepticism. It is clear that whilst OA has come a long way in the last five years, there is still a lot still to do in making open access work. The major question associated with open access is no longer whether OA should be at the centre of the mainstream scholarly communication system, but how? The key challenges are now about how to make OA work, not whether it should happen at all. That was the conclusion I came to following a large-scale analysis of the OA discourse from the last five years. In that time, we seem to have moved from a position of ‘whether’ to one of ‘how’. I looked at the peer-reviewed literature on OA and also at relevant reports, press articles and ‘informal’ communication channels (blogs, email discussion lists etc) which together make up the OA discourse. 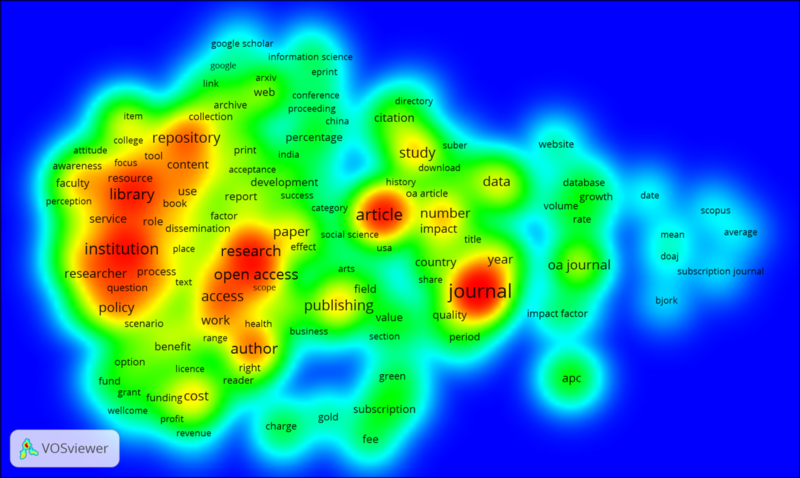 I used a textual analysis tool (VOSviewer) to visualise important terms from 589 key articles on OA identified from peer-reviewed journals (a corpus of over 2.5 million words). I then used the output from VOSviewer to identify major themes which could then be explored further both in the peer-reviewed literature and other sources. A VOSviewer visualisation is a “two-dimensional map in which terms are located in such a way that the distance between two terms can be interpreted as an indication of the relatedness of the terms…based on co-occurrences in documents” (van Eck and Waltman, 2011). For the visualisations, commonly occurring terms are clustered, with a cluster or major sub-cluster effectively representing a topic or theme from the corpus. The visualisations above and below show two main clusters of terms from the OA literature, most clearly seen in the ‘network’ visualisation. One cluster (on the left-hand side above) includes major terms such as research, author, policy, institution, library and repository. The second cluster includes journal, OA journal, article, publishing, APC (article processing charge) and subscription. 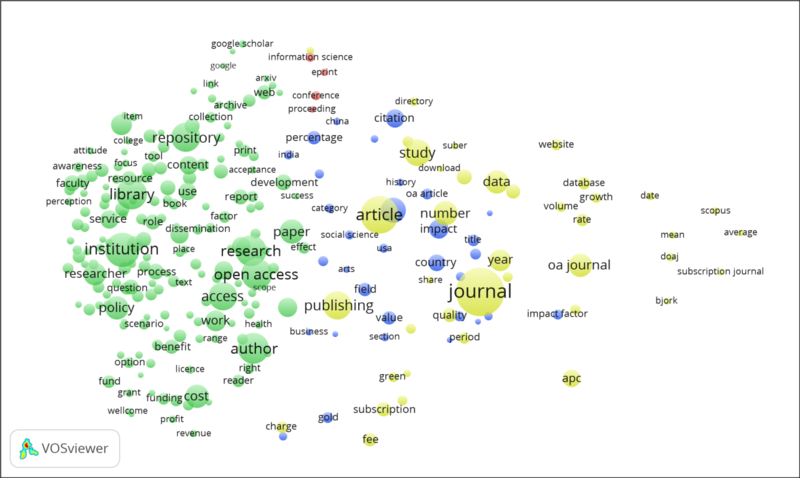 These two clusters, interestingly, seem to correspond, in general terms the least, to the two main routes to OA: ‘Green’ OA (depositing of materials in OA repositories) and ‘Gold’ OA (OA publishing in journals). The fundamental pattern of the literature in this respect seems to reflect the Green-Gold duality current in OA discussions. In addition, throughout the term map there are also indicators of work undertaken in the last five years to establish an evidence base for OA, with words like percentage or participant appearing. Other key terms relate to countries (e.g. China, India, USA) and disciplines (humanities, medicine, social sciences etc). These were useful in framing further discussion on the broad range of issues. They all have in common one thing, however: controversy. OA remains controversial, and there is controversy in every one of these thematic areas of one sort or another. There is also complexity. This was reflected in the range of questions and challenges that became clear after further investigating main thematic areas in detail. From my investigations, a set of propositions were developed based on the OA discourse which attempt to summarise the current ‘state-of-the-art’ of OA. There are 18 of them. Admittedly, 18 is not a very attractive number – 10 or 12 would have been neater! But the number of issues that emerged from analysis of the OA discourse seems to reflect the current complexity of the situation and could not easily be reduced. So, here are the 18 propositions. The first proposition (1) is that the Green-Gold debate continues to underlie much of the discussion on OA and there remains uncertainty and disagreement about the relationship between them. There are vociferous advocates of either one or the other, although some have argued for there being complementarity rather than competition between the two. Greater clarity around this debate is not likely to emerge in the very near future, although (2) the evidence base enabling a better understanding of OA is growing (but still needs to be further developed). A number of different studies have been conducted over the last five years which give us a much clearer idea of the levels of OA, and (3) the available evidence does suggest that open access is now entering the mainstream of scholarly communication. A recent report, for example, suggests that 34% of the literature globally is OA within 24 months of publication (43% for the UK). Despite the growing importance of OA, (4) there undoubtedly continues to be significant levels of disinterest, suspicion and scepticism about open access amongst researchers, particularly in relation to quality. There is considerable inertia built into the existing system with reputation building (the currency of academic research) still clearly based on traditional approaches to scholarly communication (including established journal brands, impact factors etc). The pattern of adoption of OA is, however, not evenly spread across disciplines, with (5) disciplinary differences an important factor in influencing the shape of OA take-up and likely to remain so for the foreseeable future. Medical and Life Sciences researchers have tended to adopt Gold OA more than most, for example, and there seems to be particular challenges associated with OA take-up in the Humanities. Open access is not, however, simply developing in the academic community organically, (6) so-called ‘mandates’ are proving to be essential for encouraging adoption of OA. The number of such policies has grown over the last five years with the Juliet service now citing 148 different mandates for research funders worldwide requiring researchers to make the outputs OA. However, (7) there remain important country-specific differences in policies and adoption patterns. The UK’s emphasis to date on Gold OA adoption, for example, sets it apart from most other European countries. One important characteristic of policy discussions in the last five years is that there appears to have been (8) an intensified focus on the question of the ‘degree of openness’ for content. The controversy about where content should be positioned on the ‘gratis-libre’ spectrum (free to read – free to read and reuse) remains important. Much of this debate is focused on licenses, particularly the merits of the Creative Commons licence, CC-BY, which allows unrestricted reuse, including for commercial exploitation. One of the key features of the OA landscape since the emergence of the OA movement has been repositories, and (9) whilst there is now a large-scale global network of OA repositories, one noticeable feature of the OA discourse is that populating and sustaining repositories remain challenging issues. This applies to subject-based as well as institutional repositories. One increasingly apparent aspect of this challenge is that (10) publishers’ (increasingly restrictive) conditions on depositing outputs in repositories, including embargoes, have the potential to impede growth of Green OA. There are increasing numbers of constraints on when, where and in what form articles can be deposited in repositories, often (controversially) specifically limiting the effectiveness of mandates. Whilst there is considerable uncertainty about the precise nature of the future of Green, there are also uncertainties about Gold OA. There are (11) increasing amounts of experimentation, variation and complexity in the Gold OA market, particularly around business models. The market for paid-for Gold (normally through payment of APCs) is growing and there is evidence that (12) subscription publishers are capturing a significant proportion of the growing Gold OA market, with little sign of moving to flip their business models to fully-OA delivery, choosing to remain rather with hybrid models which also maintain an income stream from subscriptions as well as APCs . One of the key questions associated with OA at the moment is what might prompt search large-scale flipping to take place? This is an important question since at the moment (13) it seems that higher education institutions are now facing a potentially lengthy transition process in making OA work on the ground with perceived costly ‘double dipping’ and constraining embargoes from publishers, along with demanding mandates from funders, looming large. To date, (14) libraries have often led policy, technical and administrative developments in institutions and have carried out advocacy to other institutional stakeholders but it is becoming clear that the OA agenda needs to be embedded more widely in institutions if it is to be fully mainstreamed. This is particularly the case since (15) open agendas are now manifesting themselves in a variety of forms institutions. Not just open access to research publications but also open data, open educational resources and other ‘opens’ which arguably need a more coordinated strategic approach institution wide. Open access can certainly fit in with institutional agendas including in particular impact (academic and societal) agendas. Impact (16) is a central issue but new ways of defining and measuring impact becoming more important many of these driven by greater openness. Linked to this, (17) the realisation of a “network-enabled” OA literature (a potential particularly associated with greater openness) whilst still in its infancy has transformative potential in terms of how researchers access and use research outputs. This in itself has significant future implications for the whole structure of scholarly communication with (18) the potential for ‘formal’ scholarly communication becoming a more open interactive ‘flow’ now becoming recognised but without clear scalable solutions yet having emerged. There is clearly enormous potential here, but there are also major challenges. Whilst OA has come a long way in the last five years, there is clearly a lot still to do in making open access work. The blogpost is based on the following journal article: Pinfield, S. (2015). Making open access work: The “state-of-the-art” in providing open access to scholarly literature. Online Information Review, 39(5), 604–636. doi.org/10.1108/OIR-05-2015-0167. E-print can be found here. Note: This article gives the views of the authors, and not the position of the Impact of Social Science blog, nor of the London School of Economics. Please review our Comments Policy if you have any concerns on posting a comment below. Stephen Pinfield is a Senior Lecturer in the Information School at the University of Sheffield. He has a particular interest in scholarly communication, open access, research data management and digital library development. He was formerly Chief Information Officer at the University of Nottingham where he was founding director of the SHERPA open-access initiative.